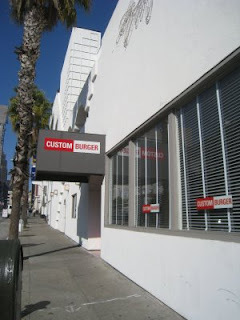 Custom Burger in San Francisco is a modern looking, creative place to get your burger. I stopped by on my way to a business meeting in San Francisco. 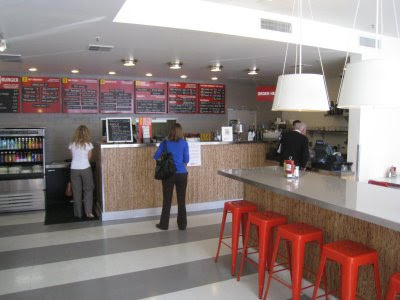 Just .3 miles off of 101 on 7th street, it is a very convenient burger place if you are passing through S.F. Walking in I was impressed by the stark, clean design of the place. The chalk boards behind the counter for each step of building your custom burger we very clear and easy to follow. I barked out my order to the cashier. Step one Angus Burger ($6.99). 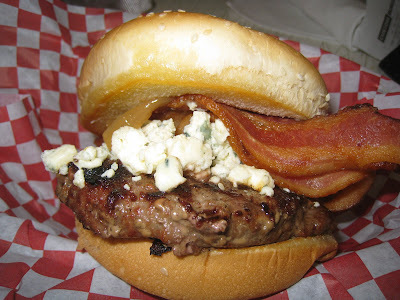 Step 2 Bleu Cheese (1.49), Bacon ($1.29), Step 3, sautéed onions, Step 4 secret sauce, Step 5 seeded bun. I also ordered a side of half and half fries and sweet potato fries ($3.79). After I saw a stack of onion rings come out, I wish I had ordered them too. I guess I will have to go back. By the way, they have lots of patty options, including a Kobe Beef, lamb, turkey, veggie, chicken or salmon! With similar variety in every step of ordering too. According to their website, they have a big commitment to local too, using locally raised hormone-free beef, buns from a local bakery and pies baked locally from scratch. I took my number a red chair at a clean laminate table. There is a standing counter with stools in the middle for those in a hurry. I had barely written a few notes when the burger arrived. The burger was in a cool little basket lined with red checked paper and sporting a side holder for a small container of the secret sauce, which looks and tastes suspiciously like thousand island. I happen to like Thousand Island dressing. I slathered it liberally on my ample sesame bun. I then placed the bun on the mound of cheese, crispy bacon and generously applied onions and took a bite. The burger was smoky and nicely pink in the middle-a good, strong flavor to counteract the bleu cheese and the secret sauce. I really liked this burger. I think next time I would tweak it with a slightly milder cheese or less bleu. The fries were also in a red-checked-paper-lined wire basket. The potato fries were hot, medium cut with skins on. Tasty and good. The sweet potato fries were crisp on the outside and soft and sweet on the inside. Yummy. I was running late for my meeting and did not have time to hang around and soak up the ambiance. But I really liked the sophistication and creativity of Custom Burger. Certainly the best I have tried South of Market. It was also nice to see someone not go for the retro theme that is so overdone in burger places.